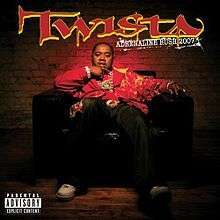 Adrenaline Rush 2007 is the sixth studio album by rapper Twista. It was released on September 18, 2007. The "2007" in the title references the ten-year passed since Adrenaline Rush. The first official single from the album was "Give It Up", featuring Pharrell and "Creep Fast (Feat. T-Pain)" was the second single. The professional review from XXL states that the content of commercial and raw talent is a good mix. The album has received generally favorable reviews. The album debuted at #10 on the U.S. Billboard 200 chart, selling about 41,000 copies in its first week; this was markedly poorer than the first week performance of The Day After, which debuted #2 with about 129,000 copies sold. The album also dropped off the charts quickly, falling to #48 in its second week with 18,000 copies sold, then falling off the Top 100. As of June 2008, the album has sold 364,000 copies, a pale comparison to the platinum status of Kamikaze (album). ↑ Katie Hasty, "Reba Outmuscles Kanye, 50 To Score First No. 1", Billboard.com, September 26, 2007.